Life is stressful – it can be a lot to handle. Stress is one of the primary causes of poor health. To understand just how detrimental stress can be to your health, you first need a basic understanding of how the body’s normal stress response works. The use of adaptogens help to balance stress. If we define stress as “anything that causes a burden on the body” there are different kinds of stress. There is actual, physical stressors in our environment like being afraid of something. Another kind of stress is perceived stressors, like things you think, feel, and worry about. There is also the type of stress that happens inside our body that we don’t necessarily notice or feel, such as inflammation. We’ve all heard of the fight or flight response. This is intended to help you either defend yourself against a dangerous situation or escape it. When confronted with a stressor, the brain sends a message to the adrenal glands to release adrenaline and cortisol, which fuels the fight or flight response in your body. In response to stress hormones, blood sugar rises, pulse and blood pressure increase, and you breathe harder. These are all designed to provide energy to evade a dangerous situation. Other bodily functions, like digestion and immune system function slow down. This allows for as much energy as possible to be dedicated to escape the stressor. You can imagine how beneficial this was to our human ancestors’ survival when they encountered a dangerous wild animal! Once the stressor is no longer a threat, our body systems return to normal and relax. In today’s modern world, the fight or flight response is often triggered by perceived stress, since we are no longer being chased by wild animals on a regular basis. Things like deadlines, traffic jams, e-mails to answer, long to do lists, worrying, and anxiety about work, relationships, finances, and family all contribute to high levels of stress in today’s modern world. We worry about so much, our bodies rarely get a chance to reset and relax. This means most of us are dealing with chronic stress. Your body and chronic stress – it’s not a pretty picture. When stressors are persistent, your hypothalamus and pituitary glands continually signal the adrenals to pump out stress hormones. This communication between the brain and these glands is known as the HPA (hypothalamic-pituitary-adrenal) axis and it’s how your brain and adrenals communicate. Under chronic stress, your adrenals can be overworked to the point of exhaustion, which is also known as adrenal fatigue. And, because no hormone works in isolation, excess stress hormones disrupt other hormone levels responsible for regulating mood, blood sugar, appetite, sleep, and libido. All those physical changes that stress induces prepare you to fight or flee, but can end up wearing down the endocrine system over time. It’s common for the thyroid to slow down in response to stress (i.e. hypothyroidism), which can then further impact everything from metabolism, weight, fertility, energy levels, and mood. If all that weren’t enough, chronic stress is linked to chronic fatigue, weight gain, premature aging, insulin resistance, inflammation, and increased risk for diabetes, cardiovascular disease, and mental health disorders. The best way to combat chronic stress is through active stress management and relaxation practices, such as deep breathing, meditation, yoga, exercise, and any other routines you find restful like massage or Epsom salt baths. Adding adaptogens to your daily routine can also help your body handle daily stressors, prevent adrenal fatigue, and support a healthy endocrine system. Adaptogens are natural based plants that help your body “adapt” to stress. 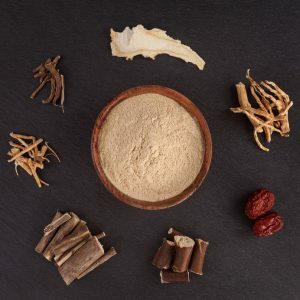 Adaptogens have a long history of use in Eastern medicinal practices, such as Traditional Chinese Medicine (TCM) and Ayruveda. They are often found in supplement or powder forms. They caught the attention of the Western world when they were used and studied during World War II to provide soldiers with energy and focus during stressful periods. Adaptogens have a generalized effect on health and well-being. They’re so named because they adapt to an individual’s specific needs. Adaptogens can be used to combat fatigue, boost mood and energy levels, and enhance cognitive function. Adaptogens balance stress. During periods of stress, adaptogens help support homeostasis along the HPA axis, balance the production of stress hormones, and counteract the taxing effects that stress hormones can have on your adrenals, endocrine system, and the rest of your body. Adaptogens don’t make stressors go away or prevent the stress response. They help normalize the hormones and other side effects so your body can have a healthier physical reaction in the face of stress. Adaptogens balance stress. Compared to caffeine, alcohol, and other drugs, there are no energy spikes and crashes associated with adaptogen use. The energizing and calming effect of adaptogens is more gentle and subtle. If you experience chronic stress, low energy, brain fog, and anxiety and/or depression, adaptogens may help you feel more balanced. There are many adaptogens, each with slightly different benefits. How do you use adaptogens? Adaptogens are available in supplement and powdered forms. Which form you choose is a matter of personal preference. The easiest way to incorporate adaptogen powders into your diet is adding them to beverages – such as tea, coffee, and smoothies. The best way to know whether adaptogens work for you is to take them for several weeks and note subtle changes in energy and mood. You don’t have to take every adaptogen every day. Pick one or two to start with, follow the dosing instructions, and use them consistently for 1-2 months. Adaptogens are all natural and generally considered safe for most individuals. However, consult with a natural healthcare provider before you begin an herbal regimen to make sure there are no contraindications or potential interactions with existing medications, supplements, or health issues. Are you familiar with adaptogens? If so, which ones have you used? Comment below if you’d like more information.